The following is Ray McGovern’s commetary on this important article. 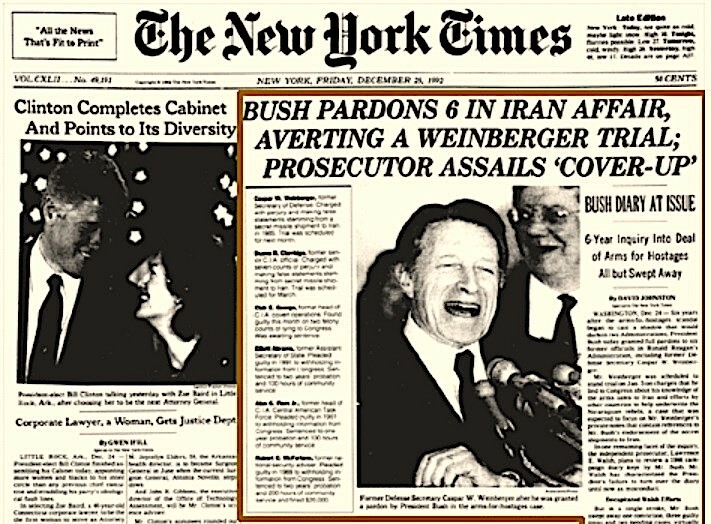 Picture the late George H. W. Bush being welcomed with open arms last night by three of the Gang of Six white-collar criminals he pardoned on Christmas Eve, 1992, just before he left office. Waiting for him were former Defense Secretary Casper Weinberger, plus swashbuckling, CIA covert action chieftains “Dewey” Clarridge and Clair George – all of them charged (and George convicted) of perjury. What a celebration is in store when the other three of the gang eventually join them. They are Robert McFarlane, the CIA’s Alan Fiers, and former Assistant Secretary of State Elliott Abrams – all of whom had already pleaded guilty to withholding information from Congress before Bush Sr. let them off the hook. Dishonest (not “mistaken”) intelligence greased the skids for the widespread killing and maiming in the Middle East that began with the Cheney/Bush “Shock and Awe” attack on Iraq. The media reveled in the unconscionable (but lucrative) buzzword “shock-and-awe” for the initial attack. In retrospect, the real shock lies in the awesome complicity of virtually all “mainstream media” in the leading false predicate for this war of aggression – weapons of mass destruction (WMD). Only one major media group, Knight Ridder, avoided the presstitution, so to speak. It faced into the headwinds blowing from the “acceptable” narrative, did the investigative spadework, and found patriotic insiders who told them the truth. Karen Kwiatkowski, who had a front-row seat at the Pentagon, was one key source for the intrepid Knight Ridder journalists. Karen tells us that her actual role is accurately portrayed by the professional actress in the Rob Reiner’s film Shock and Awe. Rep. Adam Schiff, who takes the chair of the House Intelligence Committee in January, has a nose for hot tips about his bete noire, Russian President Vladimir Putin, as well as a strong bent toward credulousness. On October 23, 2018, Schiff solemnly told a young audience at the old Hillary Clinton/John Podesta Center for American Progress Action Fund that he had been told that Putin has one of his henchmen follow Russian Prime Minister Dmitry Medvedev around with a pillow to smother him in his sleep if he ever gets out of line. No, the video contains no hint that Schiff was speaking tongue in cheek. Perhaps worse, no one in the audience laughed (where do they recruit such credulous young folks? ).